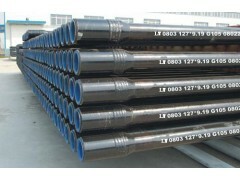 The Pipe Body conforms to API5DP with serious inspection in Plant. Tool Joints are made of AISI 4137H premium alloy steel fully Q&T with IPSEN furnace. All tool joints should be inspected by fluorescence magnetic particle and ultrasonic method. The welding between drill pipe and tool joint is machining with Friction welding machine. The welding process by means of computer control is swift and steady going. Weld zone is quenched and tempered through induction heating process, which is controlled real time by computer.